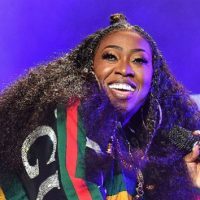 Paras Griffin/WireImageMissy Elliott surprised her “funky white sister” and performed her classic “Work it” with her Thursday on The Ellen DeGeneres Show. Mary Halsey, who dubbed herself Missy’s “funky white sister,” went viral over the summer when she posted a video of herself performing “Work It” at a karaoke contest. After Halsey was interviewed by Ellen DeGeneres on Thursday’s show, she began to perform the song solo, but the iconic rapper surprised her and joined her onstage. When Mary and Missy sat back down to speak with Ellen, Missy explained why Mary’s video is so special. After their performance, Missy gave Halsey a custom made T-shirt which she autographed. Then Ellen presented the 47-year old karaoke star from Rhode Island with a custom-made jacket with the words “Missy’s Funky White Sister” on the back.